Since the launch of Google Latitude earlier this year, we've been getting a lot of feature requests. One of the most popular ideas was for Latitude to keep track of location history, allowing you (but not your friends) to see where you've been at any point in time. Another popular idea was to notify you when you're near your Latitude friends so you can easily meet up or grab lunch. Today, we're happy to introduce both Google Location History and Google Location Alerts (beta) to let you do even more with Latitude. People also want to know when their friends were nearby, but it's not always convenient to keep checking Latitude to see if a friend has recently shown up near you. After working on this for a while, we realized it wasn't as straightforward as sending a notification every time Latitude friends were near each other. Imagine that you're Latitude friends with your roommate or co-workers. It would get pretty annoying to get a text message every single time you walked in the door at home or pulled into work. To avoid this, we decided to make Location Alerts smarter by requiring that you also enable Location History. Using your past location history, Location Alerts can recognize your regular, routine locations and not create alerts when you're at places like home or work. Alerts will only be sent to you and any nearby friends when you're either at an unusual place or at a routine place at an unusual time. Keep in mind that it may take up to a week to learn your "unusual" locations and start sending alerts. To enable these features, go to google.com/latitude/apps. 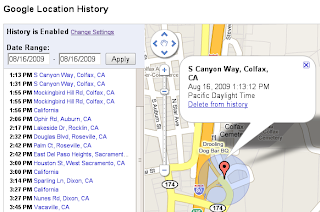 You must first be an existing Google Latitude user; if you're not already, sign up here. You must explicitly enable each feature, and of course, you can disable it at any time. Learn more in the Help Center about Location Alerts and Location History, suggest and vote on ideas in the Mobile Product Ideas page, or report problems in the Mobile Help Forum.